One of the keys to getting people to buy your products or opt-in for your newsletter is to make sure you write about what your customer gains. Most copy focuses on features and micro-ingredients/services, not the benefits that your customer can imagine. 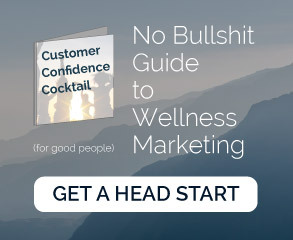 If you help run the marketing & eCommerce of a health-oriented business, connecting with people on a very basic level is your goal. Healthy products and services speak best to people’s needs for a better, more comfortable life, and you be getting to their hearts with a pitch about your hard work to make the product. Your customers will best respond to real-life attainable feelings & benefits. Losing weight, better digestion, less gas, better sleep– these are the things that people hunger for. Showing how your healthy product will make your customer's life better will capture their attention. You don’t want to stop at what the customer will get, you want to tell them why your service or product will matter to them. By focusing on solving your customer’s needs you will make people WAY more interested. Ever hear a computer salesman (or website) tell you about how much dedicated ram you have on your graphics card and the exact model, XVGB-2900 or some nonsense? That’s what we want to avoid. Those are benefits you can measure since you’re in the market for a more capable computer, not a bunch of serial numbers. Sometimes your service can sound like serial numbers to a customer. Instead, speak to your customer about why your product or service will benefit them. You will receive [product/service], which will make you [specific benefit]. You can feel [specific benefit] with our [product/service]. If your product or service copy sounds like “This product includes [fancy ingredient]” then you know what you need to add. Tell them why they should care. Tell your customer what they will get from ingesting that fancy ingredient, and make it relatable. You can start by saying it in the most plain language possible that addresses one specific issue. Did this article help you? Please share this with a friend who would benefit from it. Learn to market & grow your Wellness Business. so I won't spam you. Ever.